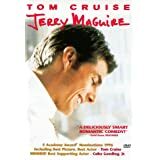 The movie stars Tom Cruise as Jerry Maguire, Renee Zellweger as Dorothy, Cuba Gooding, Jr. as Rod Tidwell, and Regina King as, his wife, Marcee. It amazes me that this is hailed as football movie. The secret of Jerry McGuire is that it is about two women, Marcee Tidwell and Dorothy Maguire. Without these two Proverbs 31 women all would have ended badly. If you missed them, read this review and see it again. Or use the link above to buy your personal copy from Amazon for your library. In the reviews I've seen and read, Regina King is not mentioned among the stars, and there is no attention paid to her character. But she is the catalyst. At the critical moment when a contract is tendered far below expectations and Rod turns to Jerry to see if he should accept what they both know is an insult, she stops the show by counseling her "strong, proud, gorgeous, baldheaded, Black man" that he is better than what has been offered. And she charts a course of suspense that culminates in the pivotal game that gets Rod's team into the playoffs, crowns Rod as the game's best wide receiver, and results in his $11 million guaranteed contract---it is Marcee Tidwell who controls the fates of Jerry and Dorothy Maguire and Rod Tidwell. Her plan involves great risks: Rod will play without a contract, showcase his talents, become a free agent and sign for no less than he is worth. It is risky for her and Rod because of the possibility of injury and/or poor play without a contract; it is risky for Jerry because Rod is his only client. It is risky for Dorothy because she has bet her life on Jerry's ability to live his dream, and it is Rod who gives life to that dream. Dorothy has far more faith in Jerry's plan than he, and demonstrates such by leaving a well-paying job at the sports agency from which Jerry was fired. She wants to help him build his own company, operated in accordance with his vision for a more humane approach to representing athletes. Without Dorothy, Jerry could not have survived. Jerry is smart enough to recognize his dependence on Dorothy and marries her, for the wrong reason. But Dorothy is a good wife, and very much like Marcee, she is also of great value to her husband. There are challenges to be overcome, but the movie ends with all well and both couples happy and $11 million richer. In describing the qualities of a wife, Proverbs 31:12 says, "She will do him good and not evil all the days of her life." Both Jerry Maguire and Rod Tidwell have found good wives. I can't close without repeating that Regina King is fantastic as Marcee Tidwell!!! Her time on the screen is minimal, but well used. From the early scene when she insists that Rod not accept a lowball contract, we do not see her again until the pivotal game she watches from her family-room packed with Rod's relatives, including his brother whom she throws out for suggesting that Rod is too small for his position and will certainly be hurt--she will not even allow family members to speak ill of Rod!